Home » Blog » 5 Things You Didn’t Know About Garfield! 20 Apr5 Things You Didn’t Know About Garfield! Our favorite wisecracking, lazy cat, has been around since 1978. Needless to say, he’s a very popular cat. Yet just how much do you know about Garfield? Here are 5 little-known facts about our lasagna-crazed feline and his pals! 1. Garfield was named after James A. Garfield Davis, Jim Davis’ grandfather. Jim Davis grew up on the family farm in Indiana, where he lived with a number of cats. 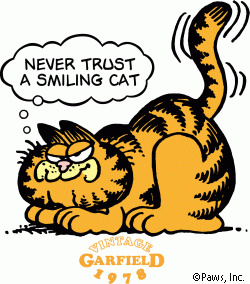 But it was not the cats that influenced Garfield’s sardonic personality; it was mainly Jim’s grandfather, James A. Garfield Davis, who was apparently a crotchety, but lovable, fellow. Many people think that the world’s favorite cantankerous cat was named after President James A. Garfield, but that’s not true. 2. He was not just a fat cat — he was obese! Garfield used to look morbidly obese in the first 6 months of his existence. In 1979, Jim Davis started to redesign Garfield to make him look cuter. He also used to walk on all fours. 3. Odie was not Jon’s pet dog, but his best friend’s. Did you know that Odie originally belonged to Jon’s best friend and roommate, Lyman? By 1988, Lyman had disappeared from the comic entirely, only to resurface in 2011. Jon Arbuckle was originally intended to become the main character in the strip. Some people advised Davis that it would be much more fun if he were to wrote the strip from the perspective of the snarky orange cat. 5. Does Jon Arbuckle actually have a job? Few people know what actually Jon does for a living, but that was deliberate. According to the very first Garfield cartoon, which ran on June 19, 1978, Jon Arbuckle is a cartoonist!